What makes Harriet Schock truly special is her willingness to share her hard-won songwriting knowledge with others. She does this with her songwriting classes, private consultations, online courses and in her seminal book, becoming remarkable. The book is an extensive collection of articles written for the songwriting community and was originally published as a regular column in the Los Angeles Songwriter’s Showcase Musepaper, and later in the periodicals of the National Academy of Songwriters. 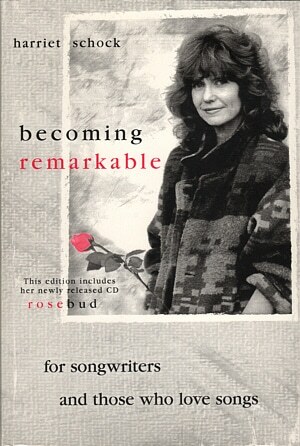 becoming remarkable, which includes Harriet’s Rosebud CD, is available here. Do We Know Where We’re Coming From? But What Do Strangers Think? Is There Life Between Songs? Listen, I just HAVE to tell you: I read your book, and all along I got the eerie feeling that you wrote it just for me (of course not, but that’s what it felt like). Every single songwriter should read your book. In fact, it should be considered required reading material for all (and especially for all the open-mikers out there!) For the last few weeks, I’ve been reading passages to my writer friends over the phone, showing them the book in person and basically (at the risk of sounding too “gushy”)… GUSHING about how pertinent it is. I started re-reading your book on the plane and I’m appreciating and enjoying it even more the second time. You’re a truly wonderful writer and artist. I hadn’t heard your CD previously. All I can say (without gushing) is that you’ve definitely got a new fan. You are truly an amazing writer and I’m so glad we got a chance to connect. I have to say that I opened your book and just re-read the very beginning areas. I cannot put it down. I think I may have to re-read the entire book again. Reading it gives me a joy that washes over me. Thank you — again. There’s a lot to say about “wrong notes” but I’m going to concentrate here on the good ones—the ones that you wait for in a song. They’re not really wrong, but they’re unexpected and give a color to the music that is rather magical. Some occur from simply non-chordal tones called appoggiatura, and we’ve all made lots of use of these. 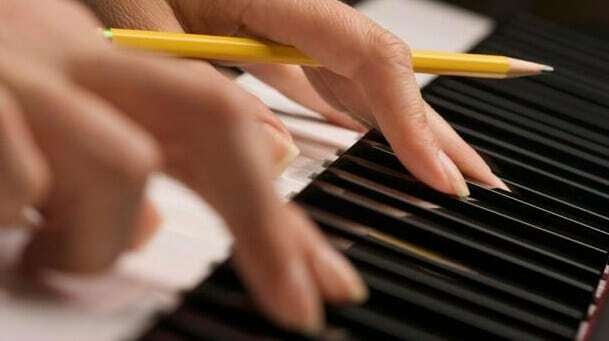 Otherwise, the melody is too diatonic, like coloring inside the lines. But let’s talk about wrong notes as in “that note is not in the scale” sort of wrong notes. Those are the really fun ones. My current songwriting student, a wonderful composer/songwriter, Robert Intriligator turned me on to the phrase “The Rodgers patented wrong note,” which was coined by Deems Taylor, a biographer of Rodgers and Hammerstein. Richard Rodgers was arguably one of the greatest popular composers of all time. His body of work is vast and in a huge variety of styles. But there is a characteristic he became so known for, they coined a phrase for it. I asked Robert Intriligator to find a bunch of examples for me, and I went to the piano and noticed that these are some of my favorite places in his music. For example in “Something Good” from “The Sound of Music” that raised fourth on the word “childhood” is what we wait for. In “No Other Love” (from “Me and Juliet”) he uses a raised 2nd on the word “you” in the phrase “only my love for you.” In “Oh, What a Beautiful Mornin’ ” the “morn” of “mornin’” is on a flat seventh of the scale or raised sixth, depending upon your viewpoint. In looking over most of his “wrong note” examples, though, Robert concluded that most of them are a raised second or fourth. Of course, in “Maria,” commonly known as “How Do You Solve a Problem Like Maria,” he uses a raised fourth as well as a raised second in the first line; but because they’re not held or accented, they simply seem like passing tones and aren’t as remarkable. In order to create a bit of dissonance, the note has to stay there for a while. All consonance in a song is like a plot in a play or movie with no conflict. It’s just not interesting enough to hold our attention. I remember when I first heard “When We Dance” by Sting I waited for that note on the word “love” in the line “like I love you.” Yeah! Of course, these dissonances, wrong notes or whatever you want to call them are everywhere. They’re not just in Richard Rodgers and Sting. It might be fun for you to look for them in the music you listen to and pick out by ear what the composer is doing. Where is the “wrong note” and which scale degree did he/she augment or flat? Anyway, studying Richard Rodgers can only help a songwriter/composer since there’s so much to learn from his music. There’s an old expression in jazz that goes something like “If you hit a wrong note, go back and hit it again in the same phrase. That way it will seem to have been done on purpose.” The trick is to find out when and where to do it on purpose the first time.